Well, what an opening night it's been in the T20 Blast. We've had pretty much everything - five-wicket hauls for teenage debutants, batsmen smashing it to all parts and a tense final-ball decider at Old Trafford. 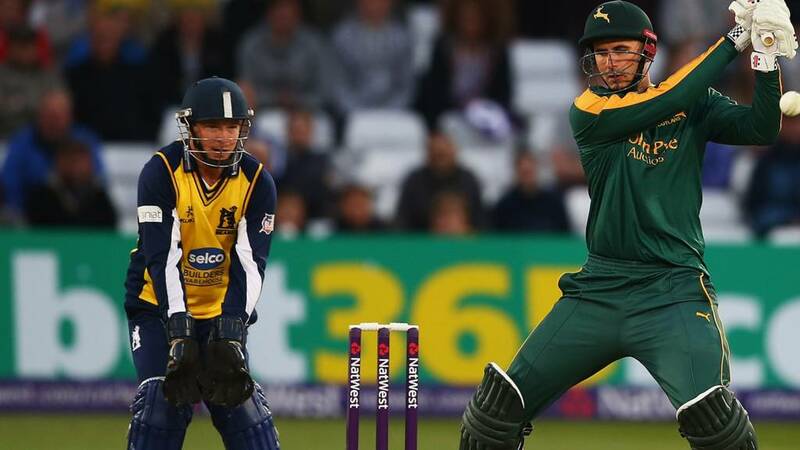 Alex Hales stole the show at Trent Bridge as Nottinghamshire beat defending champions Birmingham Bears by eight wickets. The opener's 86 not out off 43 balls included eight sixes - six of them in successive balls he faced. At Headingley, 17-year-old Matthew Fisher took 5-22 as Yorkshire easily saw off Derbyshire, while Glamorgan hit 240-3 - the fourth-highest score in domestic T20 matches in England - to beat Surrey. Elsewhere, Lancashire beat Leicestershire with a last-ball boundary from Steven Croft, Durham won a rain-affected tie with Northants, Gloucestershire defeated Middlesex and there were also wins for Kent and Hampshire over Sussex and Essex respectively. click here. We'll be back again with another live text commentary and more commentaries from BBC local radio and 5 live sports extra next Friday. Thanks for your company this evening. "1st #TMSt20 in the books! Stunning display of hitting by Alex Hales! Get that boy in the England team!!! Any format! Hope you enjoyed!" McBusted's Harry Judd: "Eeeerrrr why was @AlexHales1 not at the World Cup? Hales, KP, Morgan, Butler, Bopara, Taylor etc, it's just so obvious surely #eng." He was there, Harry, England just didn't pick him until it was too late. Sussex captain Luke Wright told BBC Sussex: "Going in to those last three or four overs, we were exactly where we wanted to be. We were three down and Mahela (Jayawardene) was in, with us needing 10 an over. With small boundaries, you'd win that most times. "I feel for someone like Craig Cachopa, who is absolutely heartbroken, but I've seen him come off many times and I know he'll come off in this tournament. He's having a tough time at the minute, but that happens. I've been there many a time myself. Everyone's got round him and we will just move on." Hampshire batsman Jimmy Adams: "It has been a tough start to the year, it is nice to start this competition on the right foot. We did a lot of things right tonight and everything went to plan. Everyone chipped in, I am delighted. "The first half-dozen balls I hit found the gaps and I was off to a flyer. It's great to play with freedom and just hit the ball." Essex captain Ryan ten Doeschate told BBC Essex: "I thought we were a bit sloppy out there and I don't think we did ourselves justice. We hit the ground slowly and there are no excuses for that. "We were fielding a pretty young side and the likes of Kishen Velani did well, but to win games a few guys need to go on and get fifties." There are two more matches to come this weekend - Surrey go to Essex on Saturday (13:00 BST) and Sussex host Gloucestershire on Sunday (14:30 BST). BBC Radio Gloucestershire's Robert Hunt: "Gloucestershire recorded their third successive win with a seven-wicket victory. Middlesex's 175 looked about par, but a light shower in the interval livened things up and made the chase a bit easier. "That will take nothing away from the home side's success though. Hamish Marshall and Iain Cockbain batted superbly against a strong attack. Although Middlesex had the bigger names, there is a real team ethos about Gloucestershire this season and they could continue to surprise in all forms." Glamorgan batsman Colin Ingram: "I thoroughly enjoyed it out there and playing all those shots, but especially because it was good for the team. Jacques (Rudolph) was reverse-sweeping and even reverse-hitting it - and I don't think I have ever seen him do that before. "We have had a tough couple of weeks in the Championship, but this could be a real turning point in the season in terms of the team's confidence. We have sung the team song in the dressing room and there is a lot of passion in the side. It's a great feeling to get off to this sort of start in the T20." Surrey all-rounder Zafar Ansari told BBC London 94.9: "We probably got stunned a little bit by the way they played and we didn't react particularly well as a bowling group. They targeted a short boundary and we just didn't have any answer. It's tough moving from four-day cricket to Twenty20 and we just didn't think quickly enough. We need to rectify that. "When Steve Davies and Kumar Sangakkara were going well at the start we felt we might be able to chase it down - even a huge total like that. The pitch was so good, but we kept losing wickets." Steven Croft - take a bow, son. The Lancashire captain gets his side home with a boundary through point off the final ball of the match. The rain played its part at Old Trafford when Leicestershire were about to begin a charge in their innings. The Foxes reduced Lancashire to 57-4 at one point as they chased a revised 140 off 15 overs, but a partnership of 74 between Croft and Alex Davies set the platform for a successful run chase. They left it late, but last season's beaten finalists start this summer's T20 Blast with a win. Nottinghamshire Outlaws captain James Taylor: "Great start to tournament tonight! Top performance from the bowlers but special mention to @AlexHales1!! Crowd was amazing as ever!" Four for Steven Croft through extra cover! Lancashire close in on victory. Ben Raine keeps his nerve for now - the first three balls off his final over have gone for just four runs, and they've also taken a wicket. How are your nerves, Lancashire and Leicestershire fans? Yasir Arafat followed up his first ball being sent for a maximum by taking two wickets in two balls to round off a good victory at Southampton for the hosts. The ex-Pakistan bowler showed his unquestionable class in his first match for Hampshire bowling Ryan ten Doeschate for 68 before rearranging Shaun Tait's stumps as the Australian departed for a golden duck. Jimmy Adams' unbeaten 55 had earlier helped Hampshire post a challenging 173-4 but the regular loss of wickets stunted Essex's reply and despite the heroics of Ten Doeschate, who only flew in from India on Thursday, the Eagles could not get over the line as they were bowled out for 156. Well well well, Ryan ten Doeschate send Yasir Arafat's first ball high in the night sky, another three of those and Essex will pick up an unlikely win. Can Ryan ten Doeschate really pull this off? He sends Fidel Edwards for a flat six while eeking four further singles off the over. In the scheme of things it was a good over from the Hampshire bowler and Essex are asking for a lot. A big mix-up between Steven Croft and Alex Davies, who have batted so brilliantly together for Lancashire, leads to the latter being stranded and run out. Five balls left, nine to win. Jordan Clark walks to the crease. Kent Spitfires kept their composure in the closing overs to pull off a victory over their neighbours at Canterbury. Sussex were cruising at 112-1, but Matt Coles (2-41) took the crucial wickets of Chris Nash (61 off 45 balls) and Mehla Jayawardene (39) as the Sharks fell short of their target. Earlier, Joe Denly (37) and Sam Northeast (40) shared a second-wicket stand of 64 for Kent, before Sam Billings weighed in with 46 off 28 balls and Fabian Cowdrey struck five boundaries in his vital cameo of 24 off 12. A wonderful reverse paddle for four through third man by Alex Davies is the highlight of the penultimate over of Lancashire's innings. They need 10 runs off the last six balls. The fat lady, or at the very least the Hampshire faithful, has begun to sing and despite Ryan ten Doeschate making his half-century off 54 balls, Yasir Arafat's third over goes for just six runs along with the wicket of Malik. As close to a perfect over as you will get this late in an innings. That may be the over that decides the match as Sussex lose two wickets from successive balls to Kent paceman Mitchell Claydon. Ben Brown is caught behind, then Will Beer follows for a golden duck as Fabian Cowdrey takes the catch - 18 off six balls needed by the Sharks. Claydon completes his stint with figures of 2-29. Big innings, this, from Lancashire captain Steven Croft. After a slow start to their reply in a rain-affected match, the home side could be set to open their T20 Blast campaign with a victory over Leicestershire. Adeel Malik is back in the hutch without facing a ball, run out after Ryan ten Doeschate decides he needs to keep the strike and leaves his partner stranded well short of his crease. Ryan ten Doeschate has not given up the fight for Essex and sends a low full toss down to the fine-leg boundary. James Vince has his hand on his head as Chris Wood fails to bowl to his field but Graham Napier edges the Hampshire bowler to Adam Weather behind. Big wicket for the hosts. OptaJim: "455 - The 455 runs scored by @surreycricket and @GlamCricket is the highest match aggregate in English T20s. Blasted." Kent can ill afford five wides from the first ball of the over as wicketkeeper Sam Billings fails to gather David Griffiths' opening delivery, but the strong arm of Matt Coles gives the home side a boost as his throw arrows in over the stumps from the deep and Matt Machan is run out - 22 needed by Sussex from 12 balls. Australia seamer Clint McKay is brought on to try to send this game back in Leicestershire's favour, but Steven Croft and Alex Davies see him off for now. This partnership for Lancashire is now worth 46 runs off 4.5 overs. Fidel Edwards returns and his variation of bouncers and in-swingers have both Essex batsman in trouble before Graham Napier sends a low full toss back over the Hampshire bowler's head for four - 12 off the over, including five extras, keeps the away side up with the run-rate. Finely poised at Old Trafford - Steven Croft (29no) and Alex Davies (14no) are going well. With 30 balls left, Lancashire need 51 to beat Leicestershire. A crucial blow for Kent as Mahela Jayawardene holes out from a full toss by Matt Coles and departs for 39. Craig Cachopa has only managed 13 from 12 balls at the other end, as he is joined by Matt Machan. Ryan ten Doeschate finds the boundary but Danny Briggs walks away with figures of 2-33 from his four overs to put Hampshire in a strong position. Jack Leaning finishes proceedings with a four as Yorkshire cruise to a seven-wicket win over Derbyshire. Seventeen-year-old debutant Matt Fisher registered the third best T20 bowling figures for Yorkshire as Derbyshire crumbled to 128 all out in 18.2 overs. Despite losing Andrew Hodd to the first ball of the innings, an aggressive 41 from captain Andrew Gale and an unbeaten 40 from in-form Jonny Bairstow saw Yorkshire home with 20 balls remaining. Jack Leaning is another one of Yorkshire's promising youngsters. He's currently 14 not out from 11 deliveries, with Jonny Bairstow continuing his excellent form with an unbeaten 39. Yorkshire need just four runs off four overs for a comprehensive victory. Steven Croft with a massive blow over mid-wicket. BBC Radio Lancashire's Scott Read describes it as being "boshed" for six. Lancashire gaining some momentum. It's almost over at Headingley as Jack Leaning flicks Mark Footitt over backward square-leg for his first six of the night. Derbyshire were celebrating as they thought they had Jonny Bairstow caught at mid-off but the umpire judged it a no-ball for height. A much better over for Kent, with only six runs added by Sussex and more importantly, Mahela Jayawardene only able to collect a couple of singles - 38 from 24 balls needed by the Sharks, the T20 winners in 2009. If Essex are going to win, it is going to be down to captain Ryan ten Doeschate. The Dutchman has 33 off 25 balls, but struggles to get Chris Wood away. Callum Taylor, aged 17, takes a couple of Wood's fourth ball to bring up the 100. Leicestershire take another wicket, with Alviro Petersen the man to depart for 10. Jigar Naik takes his first wicket of the match. Captain Steven Croft is joined by young wicketkeeper Alex Davies with Lancashire needing 83 off 47 balls - they need to get a wriggle on. Kent fans may be spitting feathers at the Spitfire Ground if they lose to their neighbours, but 44 off five overs looks eminently gettable for the Sharks with Mahela Jayawardene looking in excellent touch on 37 not out from 26 balls. Earlier, Chris Nash made 61 off 45 balls with 10 boundaries. Kent spinner James Tredwell has left the field after completing his four overs for figures of 1-32. It's over at The Oval, where Glamorgan have beaten Surrey by 25 runs. A sparkling batting display, spearheaded by Jacques Rudolph (62) and Colin Ingram (91), put Glamorgan well in control. Their 240-3 is the fourth-highest total ever scored in domestic T20 cricket in England. Surrey gave it a go in reply, Steven Davies and Zafar Ansari both passing 50, but they fell short of that daunting total. In total, the crowd saw 455 runs - they certainly got their money's worth in south London. In modern T20 cricket, scoring 100 off 10 overs is by no means an impossible task, but Essex are teetering on the point of no return as Greg Smith is stumped off Hampshire's Will Smith for 30. James Foster and Ryan ten Doeschate will need to be there close to the end if they are going to pull off a victory. Kent pace bowler Matt Coles gave away 17 in his first over, but returned to bowl Chris Nash for 61 to reduce Sussex to 118-2. With Mahela Jayawardene still in and eight wickets in hand, you would fancy the Sharks to chase down the 64 runs they need off the remaining eight overs. Spinner David Wainwright has been smashed for three sixes off five balls by Yorkshire before Derbyshire team-mate Ben Cotton has Andrew Gale caught behind for 41 off 36 balls. The White Rose county need 29 runs off 40 balls. Click here for live scores. BBC WM Sport 95.6: "Varun Chopra will have a scan on his finger injury to see if he can play for @CricketingBears @BearsT20 on Sunday v Durham." Two overs to go at The Oval, where Surrey need 39 runs to secure an unlikely win against Glamorgan. Gareth Batty's departure for 12 means it's down to Zafar Ansari, who remains at the crease with 56 off 27 balls. BBC Sussex Sport: "Commentator @brucetalbot1 on Jayawardene "I am sure he is going to be the match-winner, oozes class as another boundary goes." Ah, the kiss of death. Liam Livingstone goes to Rob Taylor for 15 off 12 balls. Leicestershire turning the screw at Old Trafford. Liam Livingstone - who made 350-odd in a club match for Nantwich recently - is at the crease for Lancashire as they chase 140 to beat Leicestershire in a rain-affected match at Old Trafford. He's hit three fours off his first seven balls and the hosts are 36-2 after four overs. BBC Sport's Kevin Howells: "Varun Chopra confirms Jonathan Trott will be back for their (Warwickshire) Championship game on Sunday v Durham." Mahela Jayawardene strides to the crease as Luke Wright is dismissed by Kent's James Tredwell, but Chris Nash reaches his 50 off only 37 balls to keep Sussex on course, as they look to make another 90 off 10 overs for victory. Having lost two early wickets, Yorkshire have steadied against Derbyshire as they chase a modest target of 129 against Derbyshire. Andrew Gale is unbeaten on 31, with the hosts needing another 58 runs off 54 balls. At The Oval, all hopes of an unlikely run chase lie with Zafar Ansari, who's reached his first T20 half-century off 23 balls. Birmingham Bears captain Varun Chopra tells BBC Radio 5 live sports extra: "We didn't start well and it was a poor performance from us tonight. Once Alex Hales gets in and he's chasing a modest total - he made a bit of a mockery out of it in the end. A couple of our guys still came away with good figures - it's a long tournament and there are plenty of opportunities to bounce back." Durham batsman Calum MacLeod: "It was a bit different from how I normally go about it. I knew (Shahid) Afridi would come on in the middle overs and would be tricky, so I wanted to get on top of the game early on. "I kept trying to guess what the bowlers would do so I could stay one step ahead of them and give myself the chance to hit boundaries." Northants head coach David Ripley: "We were well beaten. We didn't know how to cope with someone coming at us so hard at the top of the order. "We were under-cooked and need to go back and get more white-ball practice." Surrey are collapsing at an alarming rate at the Oval with Glamorgan's Dean Cosker the main architect of their demise. The spinner bowled Steven Davies for 58 before trapping Aneesh Kapil and Vikram Solanki leg-before and having Gary Wilson caught by Jacques Rudolph. With six overs remaining the hosts need another 90 runs with only four wickets left. In the words of Lord Paddy Ashdown, if Surrey win from here I will eat my hat. Yasir Arafat has claimed his first Hampshire wicket of the season, as Kishen Velani becomes the third Essex batsman to be clean bowled, with the visitors reduced to 47-3 after seven, chasing 174 to win. Nottinghamshire captain James Taylor tells BBC Radio 5 live sports extra: "It was the Alex Hales show in our innings. We'll miss him but we've got guys who can step into the fold. Greg Smith opened the batting for Leicestershire last year and did an outstanding job. It was a thoroughly clinical performance all the way through." Gloucestershire captain Ian Cockbain: "Head coach Richard Dawson rang me last week to tell me I would be captain in the opening T20 games so I have had a bit of time to get my head around it. "I couldn't have hoped for a better start. We thought the Middlesex total was very competitive, but I think the drizzle that got on the pitch while we were batting actually helped us. It meant the ball slid on and it was easier to strike through the line." Middlesex batsman Nick Compton: "I have always fancied opening in T20 cricket, but down at Somerset where they had Marcus Trescothick and Craig Kieswetter, there quite rightly wasn't much opportunity. "We made a good start to the game, but lost a bit of momentum after the powerplay and I point the finger at myself for that. I found it difficult to get the ball away because the pitch was a bit sticky. I thought 175 was a par score. With those type of wickets you have to vary pace and field settings, which is something we need to learn quickly." Well, that ended as a bit of an anti-climax - a wide ball and a scampered bye. But the rest of the Nottinghamshire innings - simply stunning. Alex Hales struck 86 not out off 43 balls, with five fours and eight sixes, to see Notts home by eight wickets and with 33 balls to spare. It was wonderful hitting from the England man, who will head off to the IPL this weekend with huge confidence. Earlier, Luke Fletcher did the damage with the ball, taking 3-24 as the hosts restricted Birmingham Bears to 141-7. Varun Chopra's 80 gave his side's total some respectability, but it was nowhere near enough with Hales in such blistering form. BBC Sport's Elizabeth Ammon: "This is absolutely incredible hitting from Hales. Why why why why did he not play in the WC?" Jay: "Doesn't Alex Hales know that displaying good batting skills will render him ineligible for selection in the national team?" Another six over the on-side for Alex Hales, his eighth of the innings, takes Notts to within 12 runs of victory. A couple of singles and a four squirted through point, and Notts are one blow away from beating the defending champions. Understandably Hales - on 86 not out - wants that honour for himself, but two air shots mean this match continues for a little while longer. Luke Wright is looking to continue his excellent T20 form from last year as his unbeaten first-wicket half-century stand with Chris Nash has taken Sussex to 51-0 from five overs against Kent. Alex Lees has been caught by Hashim Amla at third man off Mark Footitt to leave Yorkshire 31-2, with the White Rose county still requiring another 98 runs from 15 overs for victory against Derbyshire. Meanwhile, Leicestershire finish on 131-7 off their 15 overs in a rain-affected game against Lancashire. George Edwards took an impressive 4-20, including wickets of the final two balls of the innings. Nottinghamshire CCC: "Alex Hales' last six deliveries. Six, six, six, six, six, six. We kid you not. Your move, @CricketingBears." Hales is 75 not out off 38 balls. This is sparkling from Alex Hales. A crowd of more than 10,000 inside Trent Bridge are loving this. Hales hits six sixes off successive balls! What a pity there was a single from Samit Patel in between to spoil the run. A few boos and groans as he takes a single from the fifth ball of the over. Make that three sixes in a row for Alex Hales. Another one smashed beautifully over long-on for a maximum. Alex Hales lifts Boyd Rankin over long-on for six and it's huge - it almost ends up in Nottingham city centre. Another one follows over deep square leg to bring up the half-century. Steven Davies is keeping Surrey in the match against Glamorgan, bringing up his 50 off 27 balls, but with the required run rate rising to over 13 the hosts are going to need plenty more from the 27-year-old to get the 136 runs they require from the last 10 overs. In a 19:00 BST match, Essex have been reduced 5-2 as Nick Browne fell to Fidel Edwards for just two after Jesse Ryder was clean bowled for a third-ball duck by Chris Wood, with Hampshire starting their defence of 173 well. Alex Hales and Samit Patel nudge a single apiece in the rest of that Jeetan Patel over - 61 needed off 54 balls. A rain delay often causes havoc and no sooner had Grant Elliott returned to the crease for Leicestershire, then was he back in the hutch as his attempted sweep off the bowling of Stephen Parry took the top edge and was caught by Lancashire's Ashwell Prince. George Edwards then picked up his maiden wicket for the Red Rose county as Kevin O'Brien was caught at cover for 47 to leave his side 111-5 after 13 overs, the game having been reduced to 15 overs per side. The weather is a factor in Leeds as well with the Yorkshire players slightly delayed in returning to the field for their innings. and Ben Cotton provides an early breakthrough for Derbyshire as Andrew Hodd is bowled for a first-ball duck. Brendan Taylor didn't look quite right out there and was lacking a little bit of timing. That shows as he lofts Jeetan Patel straight down the throat of Tom Lewis at deep square leg. Samit Patel in next for Notts, whose battling line-up is one of the most imposing in the T20 Blast this summer. Looks like being a tidy over from Rikki Clarke, until Brendan Taylor plonks him straight back over his head for four. It just evades the outstretched arms of Keith Barker. We're at the halfway point of Notts' innings, and the hosts are 78-1 at Trent Bridge, chasing 142 for victory. Opta Jim: "Glamorgan's 240/3 is the 4th highest total in domestic English T20s. Next highest at The Oval is 217, by Lancashire in 2005. Imposing." Another spinner, Ateeq Javid, is brought into the Birmingham Bears attack and only goes for four off his first over. Now 69 needed off 66 balls. Alex Hales pulls Boyd Rankin for four and tries it again, but not so successfully. Luckily for the Notts opener, it lands safe. Even luckier, the throw in hits the stumps and he picks up a cheap overthrow. Hales 32 off 21 balls. BBC London's Kevin Hand: "Incredible from Marshall (56) & Cockbain (91*), made a tough chase look easy against a strong attack. Middx kicking themselves." Kent finish with 185-9, thanks largely to captain Sam Northeast, who made 40 off 29 balls, and wicketkeeper Sam Billings who hit a 28-ball 46. Oliver Robinson's three wickets for Sussex checked the hosts late on, but the away side will require Chris Nash and Luke Wright to start well under the floodlights. Meanwhile, Jimmy Adams' unbeaten half century helped Hampshire to 173-4 after a slow start against Essex. Ryan ten Doeschate, who flew back from the IPL to captain his side, took 1-15 from his two overs. Apologies for the slight delay with this live text - we've had a few technical problems with all of our live pages this evening. Hopefully things appear to have sorted themselves out now! Thanks for sticking with us. Two more lbw shouts turned down, this time Jeetan Patel the unlucky man as he appeals unsuccessfully for the removal against Brendan Taylor on two occasions. The powerplay ends with Notts 55-1 and requiring 87 runs from the final 14 overs. Notts are still ticking along nicely and, with Alex Hales still there hitting boundaries for fun, they should go on to win quite comfortably from here. Scotland batsman Calum MacLeod blasted 12 fours in his 60 off 32 balls as Durham Jets beat 2013 winners Northants Steelbacks in a rain-affected contest at Chester-le-Street. MacLeod shared an 84-run partnership with Phil Mustard (51) as Durham posted a total of 174-8. Northants struggled to 47-5 after eight overs in reply, with two wickets each for Chris Rushworth and Usman Arshad, but the crowd were denied the chance to see whether Shahid Afridi (pictured bowling) could rescue the visitors as the rain closed in with the all-rounder on three not out, and no further play was possible. Alex Hales escapes a shout for lbw and then works the next ball to the on side for a single. Notts need 96 from 90 balls. A breakthrough, and how it was needed for Birmingham Bears. Riki Wessels doesn't quite catch a swish to the leg side and Tom Lewis safely pouches the ball on the boundary's edge. A wicket for Rikki Clarke, and Brendan Taylor - a star at the World Cup earlier this year with Zimbabwe - is the next man in. What a night it is turning out to be for young Matthew Fisher, his first T20 appearance, and the Yorkshire bowler has claimed a maiden five-for. The 17-year-old has taken the third best figures for a White Rose bowler in the competition as Derbyshire were bowled out for only 128 from 18.2 overs. Hashim Amla top-scored with 29 and Chesney Hughes made 27 off 19 balls, with three fours and a six, before a rampant Fisher delighted the Headingley crowd. Alex Hales, feeling a little left out on two not out, gets in on the act and swipes off-spinner Jeetan Patel over deep square leg for six. He then adds a swept four. This is too easy for Notts. Admittedly Birmingham are missing some key men, but they're looking anything but defending champions here. Durham CCC: "And.......it's raining again. #DurhamJets"
An unbeaten 91 from captain Ian Cockbain helped Gloucestershire to a seven-wicket victory over Middlesex at Bristol. Nick Compton's 78 from 53 balls looked to have put Middlesex in a strong position as they made 175-3 on a pitch that grew slower as the game progressed. Hamish Marshall began aggressively, striking six fours and two sixes in his 56, before Cockbain's clean striking ensured that Gloucestershire, who have not reached Finals Day since 2007, won with six balls remaining. "That's dismissive and that's what we want to see in the T20 Blast. That six went miles back. It's what T20 cricket is about." Riki Wessels wants to get this one over with quickly. A superb lofted drive over mid-on and a hige six over mid-wicket, and he's on to 30 off 15 balls. Yorkshire CCC: "Fisher gets his fourth! Another one for the 17-year-old, this time he gets Tom Poynton (27) caught behind. Der 115/8 off 17"
Chris Wright replaces Rikki Clarke and creates a chance immediately. Alex Hales squirts a pull shot high to fine leg but Keith Barker can't quite grasp it. A tough opportunity but, defending 142, one you feel they needed to take. Gloucestershire look like chasing down their target of 176 against Middlesex with acting skipper Ian Cockbain, who is in charge of the T20 side until Michael Klinger arrives, is unbeaten on 68 off 40 balls having hit seven fours and three sixes. Paceman Steven Finn finished with a respectable 2-29 from his four overs with the hosts needing 16 off 16 balls. Glamorgan have pummelled the Surrey bowlers to post 240-3 off their 20 overs, with Jacques Rudolph (62), Colin Ingram (91) and Chris Cooke (46 not out) leading the attack. Five of the bowlers had economy rates of over 11. In reply, Surrey soon lost Jason Roy and were 5-1 off the first over. Perhaps Roy was a victim of live text commentators curse, after we said he was one to watch. Keith Barker opens up at the other end and Riki Wessels greets him with a powerful pull shot, but he picks out a fielder and only gets one for it. Alex Hales is off the mark with a single to fine leg. Back with Wessels, who steers Barker through point for four in successive balls. Too much width from the bowlers, and it's being punished. Riki Wessels steals the strike with a single off the last ball of the opening over. Notts 9-0 at the end of the first over. That's not a bad start from Riki Wessels, turning Rikki Clarke through mid-wicket and then timing him perfectly through the covers for two boundaries from the first two balls. Wessels straight drives the fifth ball and hits Clarke on the foot, leaving the Birmingham bowler in a heap. Yorkshire are all over Derbyshire in Leeds as the away side lose five wickets for just 15 runs with Shiv Thakor, Ben Godleman and Scott Elstone all falling cheaply. Richard Pyrah and Matthew Fisher have both picked up two wickets to leave the visitors struggling on 82-6 off 13 overs. Both Michael Carberry and James Vince depart in the 30s for Hampshire as Adeel Malik, brother of Pakistani player Shoaib, claims his first T20 scalp of the season for Essex. The home side are 116-2 after 14 overs. And, Sussex's Mahela Jayawardene has committed the cardinal sin of dropping Sam Billings of Kent just as he starts to find the boundary ropes. However, the home side continue to lose wickets and are 134-4 off 15 overs. Lancashire CCC: "If there is no further rain, play will resume at 8.30pm with 15-overs per side." They have dodgy weather in the IPL too with Royal Challengers Bangalore facing a target of 81 from six overs against Sunrisers Hyderabad - but they have the men to do it with Chris Gayle, who is Somerset bound, and Virat Kohli opening the batting. Sunrisers earlier made 135-3 from 11 overs with Australia opener David Warner making an unbeaten 52 off 32 balls. Marcus Hook: "This is only the second time Glamorgan have made 200+ in T20 cricket. Needless to say, this is now their highest total." Glamorgan's previous highest T20 total was 206-6 at Taunton in 2006. The players are back out at Trent Bridge. Notts openers Alex Hales and Riki Wessels will set off in pursuit of 142 to beat Birmingham Bears, the T20 Blast defending champions. Listen to live commentary on BBC local radio and BBC Radio 5 live sports extra via the Live Coverage tab. Weather update - play to begin at 20:15 if no more rain. Northants, currently 47-5 after eight overs, will face a revised target of 151 to win from 15. Remember, all eight of tonight's T20 Blast matches are being covered by BBC local radio. Listen to live commentary of the match of your choice by clicking on the Live Coverage tab. Commentary is available on desktop, tablet and mobile devices. Gloucestershire are not hanging around against Middlesex as Hamish Marshall launches James Harris for a flat six and moves to his half-century with a single off Ravi Patel. With light rain coming down, the home side are 92-1 off 10 overs, needing another 84 runs to win from their last 10. Glamorgan have achieved a new T20 record score at the Oval against Surrey despite seeing Colin Ingram bowled nine short of a century by Wahab Riaz. Chris Cooke has come out and smashed four sixes in a 16-ball 42 to take his side to 224-3 off 19 overs. Sadly the weather is having an effect on the evening's entertainment with Leicestershire off the field after reaching 105-2 off 11.2 overs against Lancashire. Duckworth-Lewis may have to decide the outcome at Chester-le-Street where Northants are 47-5 off eight overs, chasing 175 for victory against Durham. A return to the middle looks unlikely. "Notts have bowled excellently. Harry Gurney kept it tight and caused some problems. He was backed up nicely by Jake Ball. Apart from the over where Tim Ambrose got into Vernon Philander, every bowler has bowled tight and caused problems. They'll be delighted with that first-innings score." BBC Sport's Elizabeth Ammon: "Think Warwickshire are about 30 short there #T20blast"
Another run out to end things. No debate about this one, as Keith Barker is hopelessly out of his ground. That's a stunning bowling effort from Notts, Luke Fletcher the star with 3-24, and the hosts will chase 142 to win their opening match of this season's T20 Blast. It could have been a lot fewer had it not been for a superb 80 from Birmingham captain Varun Chopra, who has given his team at least something to bowl at. Varun Chopra's innings is over - he's run out going for a second run, out by a yard. Chopra hit nine fours and a six in his 80 off 61 balls, the six coming immediately after he was dropped. Disappointing picture at Old Trafford where the players are off the field with Leicestershire Foxes 105-2 in the 12th over against Lancashire Lightning. Varun Chopra feared the worst as he skied Harry Gurney high in the air, but Vernon Philander spills it and the Bears' captain remains at the crease. Ateeq Javid joins his captain Varun Chopra at the crease and picks up two off his first ball. Luke Fletcher's work is done - 3-24 off his four overs. One more to go. Varun Chopra has gone through the gears, hitting the first two balls of Luke Fletcher's over for four. The third goes to fine leg for a single. Laurie Evans on strike, and he's bowled! A third wicket for Fletcher, and Evans' enterprising innings of 35 off 29 balls is ended. Essex CCC: "A mild evening is now turning into a rather chilly one here in Southampton. A good crowd in a cheerful mood #UpUpEagles #HamvEss"
Hampshire are ticking along nicely and it is Michael Carberry who has taken it upon himself to up the scoring rate as his five fours have taken the home side to 45-0 after six overs against Essex. Tim Bresnan has Derbyshire captain Wes Durston caught at third man by Adil Rashid for eight before 17-year-old Yorkshire debutant Matthew Fisher claims his first T20 wicket, having Chesney Hughes caught at point by Richard Pyrah to leave the Falcons 69-2 after nine overs. Eight overs gone at Canterbury and Sam Northeast is not holding back as he sends Oliver Robinson's second over for Sussex for 17, including four consecutive fours. Kent are nicely poised on 77-2. This partnership between Varun Chopra and Laurie Evans is now worth 68 off nine overs. Not too many boundaries though. Chopra tries to change that but his Rory McIlroy-style swipe ends up with the ball about three inches from his feet. Only five off this over from Luke Fletcher and that's not enough at this stage, really. More excellent bowling from Fletcher, who has agreed a loan move to play in the Championship for Surrey today. It's 2-13 off three overs for the big seamer. BBC London's Kevin Hand: "Fifty partnership now at Bristol of which Cockbain has just 13. Middx need Marshall and quickly. #bbccricket"
Lancashire CCC: "Oh dear, the rain has returned and the sheets are returning to cover the square." Oh, that's one that Brendan Taylor should take. Laurie Evans gets an edge to a Jake Ball delivery and wicketkeeper Taylor adjusts his feet well, but he can't pouch the catch. Is that the break that Birmingham need? BBC Radio Newcastle's Martin Emmerson: It's virtually dark here and raining. @NorthantsCCC struggling on 45-5 after 7 overs. @DurhamCricket ahead on D/L by 28 runs. Middlesex claim an early wicket as Chris Dent is caught by Joe Burns off Steven Finn to leave Gloucestershire 33-1 off four overs - but there is rain in the air at Bristol and we may be looking at a reduced match. Meanwhile, with the light fading at Chester-le-Street, Northants are in all sorts of trouble on 41-4 off six overs as Chris Rushworth picks up his second wicket of the innings for Durham before Usman Arshad bowls captain Alex Wakely for a duck and Richard Levi for 26. It brings Shahid 'Boom Boom' Afridi to the crease, can he rescue his side? Kevin O'Brien has raced to 43 off 23 balls (see photo) as Leicestershire pass the 100 mark with just 11 overs bowled by Lancashire, and the away side are on for a big score. Jacques Rudolph and Colin Ingram are both into the 60s as the Surrey bowlers struggle to contain Glamorgan, who are 156-1 off 14 overs. Vernon Philander back into the Notts attack and starts the over nicely, but Laurie Evans shows his inventive side to turn his through square leg for four, and then he clubs Philander over long-off for six. The century is up and the charge is on. Birmingham Bears director of cricket Dougie Brown tells BBC Radio 5 live sports extra: "They've bowled particularly well and made it difficult for us, but there are six overs left and anything's possible in T20 cricket." Laurie Evans hits the first six of the match, smearing Steven Mullaney over mid-wicket for a maximum. He and Chopra building some momentum ahead of an expected charge in the final six overs of the innings. Birmingham Bears captain Varun Chopra reaches his 11th T20 half-century and he'll be vital for the defending champions, who were 8-2 at one stage, if they are to get a decent total. Seven off Steven Mullaney's over and Varun Chopra is nearing a deserved fifty. He's 48 off 39 balls. BBC Sussex Sport: Co-commentator @brucetalbot1 on Oliver Robinson "Everything he does at the moment for @SussexCCC turns to gold." Robinson, the stepson of England's temporary coach Paul Farbrace, has taken 12 wickets for Sussex in two Championship games, as well as his first T20 wicket for the club. We are up and running in our 19:00 BST matches now and Hashim Amla has settled in nicely for Derbyshire as Yorkshire's Jack Brooks goes for 12 in his first over. The away side are 25-0 after three overs, with Amla on 18. Joe Denly has also started sharply sending Steve Magoffin for a four and six, but Oliver Robinson has Daniel Bell-Drummond caught behind for one with his second ball to leave Kent 16-1 off their first two overs. However, Hampshire openers Michael Carberry and James Vince have started off rather watchfully against the Essex bowlers, with just one boundary in their opening two overs to take them to 8-0. Varun Chopra reverse sweeps Samit Patel for four and then lofts him over the covers for another boundary. The Birmingham skipper onto 42 and holding this innings together. "Samit Patel is an excellent player in this format. He brings a lot with the bat and ball, and he'll always be in the game." Steven Mullaney's second over is another tidy one. Six runs from it, 0-10 off his two. And another spinner about to come on, as Samit Patel spins himself a couple of catches before preparing to bowl. Luke Fletcher strikes again, for the second time in the over, as Rikki Clarke attempts to smear him over mid-wicket and instead drags onto his stumps. BBC Radio 5 live sports extra's Charles Dagnall says Birmingham are "in a pickle" and it's hard to disagree with him. Laurie Evans joins his captain Varun Chopra at the crease. James Franklin may have to put some of his wages towards repairing a fan's car as he hits the final ball of the Middlesex innings for a massive six into the parking area at Bristol as they post 169-3 off their 20 overs against Gloucestershire. After losing an early wicket, Leicestershire raced along with Ned Eckersley making 29 off 14 balls, hitting four fours and six, before being caught at mid-wicket off Lancashire's Steven Croft to leave his side nice poised on 64-2 off six overs. South African batsman Colin Ingram has struck paceman Tom Curran for two sixes as Glamorgan raced to 57-1 off their first six powerplay overs. And, there is early joy for Durham as Chris Rushworth claims the vital wicket of David Willey, who departs for a first-ball duck caught by John Hastings at gully, to leave Northants 8-1 after one over. Luke Fletcher with a beauty! And Tim Ambrose is on his way back to the pavilion. Or the dugout. Whatever they have in the T20 Blast these days. Ambrose has no chance as a yorker beats his bat and rattles the timber behind him. Rikki Clarke is the new man in. Notts definitely on top. Jonathan Trott, not playing tonight, can only watch on glumly. Birmingham Bears pass 50 in the eighth over, off-spinner Steven Mullaney going for just four off it. BBC Radio Northampton's Chris Egerton: "Just 28 runs taken off the last 5 overs by Durham. Northants not without a chance. But still tough chase." Luke Fletcher replaces Harry Gurney and goes for five runs in his first. Varun Chopra is 28 not out off 21 balls. "Varun Chopra and Tim Ambrose are leading the Bears' opening defence of their title after a difficult start at Trent Bridge." BBC London's Kevin Hand: "First 6 of innings comes in penultimate over, despite Middx's strong showing with the bat - again that tells story about pitch." Live commentary of Gloucestershire's run chase can be heard via the Live Coverage tab. Welcome to the T20 Blast, Vernon Philander. The South African seamer is despatched through the covers twice by Tim Ambrose, and then plonked through mid-wicket for another boundary. So 14 off the over, and the powerplay ends with Birmingham 41-2. Yorkshire are one of the few teams in action tonight without an international player, with Australia's Glenn Maxwell joining them next week and Aaron Finch still injured. Jonny Bairstow is in rich form at the moment after scoring a century in the County Championship, while Liam Plunkett returns to boost the bowling attack. For Derbyshire, Hashim Amla will open alongside Wes Durston. Amla has made 600 international T20 runs, in just 26 appearances. Yorkshire Vikings: Gale (capt), Hodd, Lees, Bairstow, Leaning, Pyrah, Rashid, Bresnan, Plunkett, Brooks, Fisher. Derbyshire: Durston (capt), Amla, Hughes, Thakor, Elstone, Godleman, Hughes, Poynton, Wainwright, Cotton, Footitt. Yorkshire have won the toss and will bowl first - live commentary via the Live Coverage tab. Hampshire, one of the form teams in limited-overs cricket over the past few years, have veteran batsman Owais Shah in their side for the home game against Essex. The visitors are skippered by Ryan ten Doeschate, who has flown back from the Indian Premier League for the game, and their attack is spearheaded by Australian fast bowler Shaun Tait. Hampshire: Carberry, Vince (capt), Adams, Shah, Ervine, Smith, Wheater, Wood, Arafat, Briggs, Edwards. Essex: Ryder, Browne, Smith, Yen Doeschate (capt), Velani, Foster, Napier, Masters, Tait, Taylor, Malik. Hampshire have won the toss and decided to bat first - live commentary via the Live Coverage tab. BBC Sport's Elizabeth Ammon: "Warwickshire have started in whatever way the opposite to like a rocket is." BBC local radio and Radio 5 live sports extra commentary from Trent Bridge, and indeed all of today's T20 Blast games, can be found via the Live Coverage tab. A little escape for Varun Chopra, who is deceived by a Harry Gurney slower ball and he chips into the covers, away from a fielder though. Chopra picks up two, then picks up another four with an on-drive. And then he almost plays on! An eventful over. Nick Compton passes his previous T20 high score of 74, before missing a straight one from Gloucestershire's James Fuller and is trapped lbw leaving Middlesex 151-3 off 18 overs. There are two wickets for Shahid Afridi, his first in a Northants shirt as Durham stuttered to 174-8 from their 20 overs, following a fast start. The Jets lost their last four wickets for just 21 runs. With rain slightly coming down at Chester-le-Street, the away side will be hoping to get in the five overs they need to make it a game. Leicestershire have started all guns blazing against Lancashire as Mark Cosgrave sends George Edwards for a four and then a six, with the away side 21-0 off two overs. And, Mark Wallace falls early on for Glamorgan, having hit Matt Dunn for two fours in the first over of the innings as Surrey's Tom Curran has him caught by Wahab Riaz for 10. Glamorgan are 18-1 off three overs. Even at this early stage, much could depend on Birmingham's Varun Chopra. The Bears skipper hits Jake Ball for three fours in the over, the second of them a superb drive through the covers. "Excellent ball from Harry Gurney. Some really good late movement. He's been bowling back of a length but he noticed that Tom Lewis was a bit vulnerable. He pitched it up and got the swing, and Tom Lewis was nowhere to be found." Harry Gurney to continue, and Birmingham captain Varun Chopra nurdles him to fine leg for four. This outfield looks lightning quick. Chopra and Tom Lewis then scamper a single. Lewis to face the last - clean bowled! Through the gate and his stumps are all over the place. Kent's Darren Stevens is one of just four players to pass 2,500 T20 runs in the domestic competition. He is well supported in the middle order by Sam Billings, who enjoyed a prolific run of form in last year's competition. Sussex captain Luke Wright has three T20 centuries to his name, while the Sharks' batting line-up has been boosted by the arrival of Mahela Jayawardene. Kent: Bell-Drummond, Denly, Northeast (capt), Cowdrey, Stevens, Blake, Billings, Coles, Tredwell, Claydon, Griffiths. Sussex: Nash, Wright (capt), Jayawardene, Machan, Cachopa, Yardy, Brown, Beer, Robinson, Liddle, Magoffin. Kent have won the toss and opt to bat first - live commentary via the Live Coverage tab. Superb over from Jake Ball. New batsman Tom Lewis is unable to score of the final three balls of the second over. Ex-Sri Lanka batsman Mahela Jayawardene will be looking to break through the barrier of 100 sixes in T20 cricket as he lines up for Sussex. He's currently on 93. He's been speaking to BBC Sport about his excitement ahead of a summer with the Sharks and playing against former team-mate Kumar Sangakkara, who is appearing for Surrey this season. Left-armer Harry Gurney will start things off, bowling to Will Porterfield. The Irishman picks up a single to mid-wicket, and Varun Chopra is off the mark too with a neat push to square leg. Almost time for the start at Trent Bridge, as defending champions Birmingham Bears open up against Nottinghamshire Outlaws. Openers Varun Chopra and Will Porterfield enter the field accompanied by a few flashes of pyrotechnics. That's going to be our featured match in this live text commentary, but don't worry - we'll be keeping you in touch with the other seven games taking place tonight. BBC London's Kevin Hand at Bristol: "Middlesex 125-2 overachieving on this pitch, I reckon. Doesn't look like the ball is coming on nicely at all. Fifty for @thecompdog." Will it be a case of hair today, gone tomorrow for retired Test umpire Dickie Bird? The Yorkshire president gives the thumbs-up to the T20 Blast ahead of their opening game against Derbyshire Falcons at Headingley. Despite being dropped on the boundary by Olly Stone in the previous over, Paul Collingwood is caught by the Northants man at mid-off. The away side are picking up wickets at regular intervals to stunt the home side's push towards 200. Sri Lanka legend Kumar Sangakkara makes his debut for Surrey tonight - he has a handy 1,382 international T20 runs to his name, including eight half-centuries. Jason Roy will also be looking to build on his scintillating form in last year's competition. Former Somerset man Craig Meschede makes his T20 debut for Glamorgan, while South Africa's Colin Ingram slots in to the top order. Surrey: Roy, Davies, Sangakkara, Solanki, Wilson (capt), Ansari, Kapil, Riaz, Batty, Curran, Dunn. Glamorgan: Rudolph (capt), Wallace, Ingram, Cooke, Wright, Wagg, Meschede, Lloyd, Salter, Cosker, Hogan. Surrey have won the toss and will bowl first - live commentary via the Live Coverage tab. Nick Compton may not be the most flamboyant batsman but he's doing a fine job for Middlesex this evening, reaching his half-century with two off Jack Taylor, before celebrating with a switch-hit for his fifth boundary from the next ball. "Driving up today from London, you started to feel it. You start looking at some of the names that will be in this competition - Vernon Philander and Brendan Taylor who we're seeing today, and there's also a lot of home talent coming through. James Taylor has really kicked on as a cricketer. I'm really looking forward to this competition." Having just reached his fifty, Phil Mustard throws away his wicket as Josh Cobb picks up his second scalp of the evening with the Durham batsman get caught at long on. Phil Mustard is the second Durham batsman to reach his half century as he sends Graeme White for two fours to reach his 16th fifty. The Colonel has shared a 53-run third-wicket partnership with captain Paul Collingwood to keep up the Jets run-rate. "Birmingham Bears give a first team debut to batsman Tom Lewis tonight after he impressed on the pre-season tour of Barbados." Last year's finalists Lancashire are fielding a strong team at Old Trafford, with Alviro Petersen making his first T20 appearance for the club. Liam Livingstone is an interesting inclusion - the youngster scored 350 off 138 balls for Nantwich in a club match last month, an innings that included 27 sixes. Australia's Clint McKay makes his first T20 appearance for Leicestershire, along with Ireland's Kevin O'Brien and New Zealand all-rounder Grant Elliott. Lancashire Lightning: Croft (capt), Bailey, Brown, Clark, Davies, Edwards, Lilley, Livingstone, Parry, Petersen, Prince. Leicestershire Foxes: Cosgrove (capt), Eckersley, Elliott, McKay, Naik, K O'Brien, N O'Brien, Raine, Sykes, Taylor, Wells. The Foxes will bat first after winning the toss - live commentary via the Live Coverage tab. Today's featured commentary on BBC Radio 5 live sports extra is Nottinghamshire Outlaws v Birmingham Bears. Birmingham Bears won the competition for the first time in 2014, beating Lancashire Lightning in the final at Edgbaston. They begin the defence of their title at Trent Bridge, against an Outlaws side containing internationals such as James Taylor, Samit Patel, Brendan Taylor and Vernon Philander. Adam Voges, who will join up with the Australian side after this match, greets Jack Taylor by sending the bowler to the boundary ropes for four. Nick Compton continues to accumulate his runs, albeit at a slightly faster rate now, with the former England opener on 41 off 32 balls. He's hit just three fours in his innings so far. on his way to India to play in the IPL. called on the national side to play without fear at the launch of the T20 Blast, is to link up with Mumbai Indians. Hales made 365 runs in 13 innings in last season's T20 Blast, with a high score of 67 and a strike rate of 137. Warwickshire and England batsman Ian Bell: "Good luck to the reigning champs tonight @CricketingBears #YouBears @NatWestT20Blast"
Bell was part of the title-winning Birmingham Bears team in 2014, but he is not involved in tonight's opener against Nottinghamshire Outlaws at Trent Bridge. We have our first six of the season, ladies and gentlemen, and it comes courtesy of the effervescent Phil Mustard as Northants continue to struggle to keep the home side in check at Chester-Le-Street. England batsman Alex Hales plays for Notts tonight before he jets off to India to appear for Mumbai in the IPL. Zimbabwe international Brendan Taylor and South Africa bowler Vernon Philander are also selected. Birmingham, the defending champions, are without England duo Ian Bell and Chris Woakes, but there's plenty of experience in their bowling attack, with off-spinner Jeetan Patel included in the team just a couple of days after reaching 500 first-class wickets. Nottinghamshire: Hales, Wessels, B. Taylor, Patel, J. Taylor (capt), Smith, Mullaney, Philander, Ball, Fletcher, Gurney. Birmingham: Chopra (capt), Porterfield, Lewis, Clarke, Evans, Javid, Ambrose, Patel, Barker, Wright, Rankin. Notts have won the toss and will bowl first - live commentary on BBC local radio and BBC Radio 5 live sports extra. Shahid Afridi makes his first contribution for Northants as he is handed the ball by skipper Alex Wakely for the eighth over of Durham's innings. But his leg-spin holds no terrors for MacLeod who adds two more fours to his impressive boundary tally as 10 come from the over. However, Josh Cobb gets rid of the rampaging MacLeod as he has him caught at fine leg, having hit 12 fours in his 32-ball 60. It brings captain Paul Collingwood to the crease, could this last season be his last chance to lift T20 silverware with the Jets? Joe Burns' first innings for Middlesex does not last long as Gloucestershire's second Taylor - off-spinner Jack - has him caught just inside the rope at long-off by Hamish Marshall. Nick Compton, at the other end, is going well on 33 off 25 balls. Desperate to know how your side are getting on in this season's T20 Blast? Fear not - you can do follow all of the action with the help of the BBC Sport app. You can set up push alerts for your selected county, which will let you know about the key moments as they happen. A quick mud bath for our reporters ahead of Nottinghamshire Outlaws v Birmingham Bears! BBC's Test Match Special: "Here's our T20 commentary team in final preparations. Join @CharlesDagnall, @henrymoeranBBC & @ejrainfordbrent at 615pm." Last year's beaten finalists Lancashire Lightning are still without a domestic T20 title, despite having reached the semi-final stage on five occasions since the competition's inception in 2003. As you can see from this picture tweeted by BBC Radio Lancashire's Scott Read, Old Trafford is bathed in sunshine ahead of tonight's opening match against Leicestershire Foxes. T20 debutant Matthew Taylor makes a vital breakthrough for Gloucestershire as he bowls Paul Stirling off the inside edge to end an opening stand of 65 with Nick Compton. Stirling hit six fours in his 24-ball knock and his departure brings Australian Joe Burns to the middle for his first innings for the visitors. Calum MacLeod has raced to his 10th T20 half-century. The Scotsman flat-bats a ball between point and cover, while falling over, to hit Olly Stone for his fifth boundary of the sixth over, which included a first-ball no-ball. Mark Stoneman will no doubt be kicking himself for getting out so cheaply on what seems like a good batting pitch. Perhaps someone in the Middlesex camp is reading the live text and has sent a message to the players in middle, as both Paul Stirling and Nick Compton start to find the boundary, with 30 runs coming off the last two overs. Among all the Surrey stars, Jason Roy was the name on everyone's lips last summer as he notched up nine fifties in the competition and ended as the leading run-scorer with 677 runs. The 24-year-old goes into the competition on the back of a 28-ball half-century, which helped his side chase down 216 in less than 22 overs against Leicestershire in the County Championship. Roy has emerged as one of the most exciting talents in the game and has earned England recognition in the 20-over and 50-over formats. Durham are rebuilding as Calum MacLeod sends David Willey for three consecutive fours before giving Olly Stone the same treatment, bringing out the reverse sweep early on in his innings. MacLeod has a T20 international century to his name, hitting an unbeaten 104 off 76 balls for Scotland against Oman in 2012. Unlike in the Big Bash, there are no flashing bails, but there are plenty of pyrotechnics and cheerleaders to keep the near 2,000 strong crowd happy. Apparently, Glasgow-born MacLeod has more than one nickname. Highlander is understandable, but Cloudy? Can you enlighten us? This is the 13th season of domestic Twenty20 cricket in England, and the second year in which the competition has been known as the T20 Blast. There may not be the razzmatazz, huge crowds and financial rewards on offer here compared to the IPL or the Big Bash. BBC Sport's Gary Smee writes, there's plenty to look forward to and plenty of world stars arriving on our shores over the next three months. Middlesex have made a leisurely start against Gloucestershire as Nick Compton and Paul Stirling trade singles, before the former hits the first boundary of the innings off James Fuller. They will undoubtedly be looking to up the scoring rate in the first six overs during the powerplay, where only two fielders are allowed outside the circle. So the T20 Blast is under way, and although some of the overseas stars are yet to arrive in England, some of the world's top talent will be appearing at a ground near you over the coming weeks. So, which players are you most looking forward to watching in this season's competition? Are you hoping for some "Boom Boom" from Shahid Afridi at Northants? A "Gayle-force" innings from Chris at Somerset? Or a "Big Show" from Yorkshire's Glenn Maxwell? Get in touch using #bbccricket on Twitter or on the BBC Sport Facebook page. Pakistan all-rounder Shahid "Boom Boom" Afridi has played plenty of county cricket in England, having previously spent time with Leicestershire, Derbyshire, Kent and Hampshire. Having made just 116 runs at the World Cup earlier this year, the explosive batsman will be looking for an improvement in form to light up evenings in Northampton this summer. Mark Stoneman becomes the first batsman dismissed in the 2015 T20 Blast competition, as South African bowler Rory Kleinveldt uproots the Durham batsman's middle stump. What a start for the 2013 champions Northants. All over the country, BBC local radio teams are getting in position ahead of tonight's T20 Blast matches. BBC Radio Bristol's Geoff Twentyman is presenting his Drivetime programme from Nevil Road, as Gloucestershire open their campaign at home to Middlesex. Listen to live commentary of all tonight's T20 Blast matches via the Live Coverage tab. So we're about to get things under way in our two early games. Northants Steelbacks, the 2013 winners, boast a powerful batting line-up for their game at Durham. They include debutant Shahid Afridi, who has a stratospheric career strike-rate of 154.37 in the game's shortest format. The Jets will look to the likes of skipper Mark Stoneman and Scotland's Callum MacLeod to give them a flying start to their innings. Durham: Stoneman (capt), Mustard, MacLeod, Collingwood, Muchall, Pringle, Borthwick, Jennings, Hastings, Arshad, Rushworth. Northants: Wakely (capt), Levi, Cobb, Willey, Shahid Afridi, Kleinveldt, Rossington, Keogh, Crook, White, Stone. Northants won the toss and opted to field first - listen to live commentary via the Live Coverage tab. "Gloucestershire are on the back of a superb championship win against Lancashire at Old Trafford - six of that team are in the side this evening." The teams have been announced for Gloucestershire's home game against Middlesex at Bristol, with Aussie batsman Joe Burns making his debut for the visitors. He has a none-too-shabby T20 career strike-rate of 122.73, with a best score of 81 not out. The home side will be skippered by Ian Cockbain, with Michael Klinger not due to arrive until after their first two matches. Gloucestershire: Dent, Cockbain (capt), Handscomb, Marshall, Jones, Noema-Barnett, Howells, Taylor, Fuller, Payne, Taylor. Middlesex: Stirling, Compton, Burns, Voges, Franklin (capt), Dexter, Simpson, Harris, Finn, Podmore, Patel. Gloucestershire won the toss and opted to field first - listen to live commentary via the Live Coverage tab. England Women all-rounder Danielle Wyatt: "Buzzing for the start of the @NatWestT20Blast that starts tonight under the lights at Headingley! Set to be a cracker of a tournament!" Four years after retiring, Andrew "Freddie" Flintoff returned to action with Lancashire Lightning and helped his county reach the final. However, there was no fairytale ending for the ex-England all-rounder, despite dismissing former international team-mate Ian Bell in the third over against Birmingham Bears. a four-run victory that gave them their first T20 title. With a new name, a new format and new groups, last year's T20 Blast had plenty of memorable moments. Luke Wright's sensational unbeaten 153 of 66 balls for Sussex Sharks against Essex Eagles, which included 11 sixes, proved that English players definitely know how to clear the ropes. You can listen to ball-by-ball coverage of every match in this season's T20 Blast from BBC local radio stations via the BBC Sport website - commentaries are available on desktop, tablet and mobile devices. In addition, BBC Radio 5 live sports extra will provide commentary of a selected match each Friday, while you can also follow a live text commentary of every set of Friday fixtures during the group phase. And if you miss any T20 Blast action, there's a weekly podcast to help you catch up. There are eight matches in all tonight. Durham face Northants and Gloucestershire take on Middlesex in our two 17:30 BST starts. Then at 18:30 BST there are three more games - our featured match is Nottinghamshire Outlaws v Birmingham Bears. Our final three games get under way at 19:00 BST and six more teams - including last season's semi-finalists Hampshire - open their T20 Blast campaigns. In all, 18 counties are hoping to emulate Birmingham Bears, who won the tournament in 2014. This year's semi-finals and final are at Edgbaston on 29 August. Who will put their name on the trophy this time around? The T20 Blast is back.